OK, this should have been my Kona Build week three analysis. Actually I was planning a double whammy of week three and four (reality is week four isn’t too interesting!) Then Maryka asked an interesting comment back in an old post. With an easier day and a bit of time on my hand I ended up plotting some entirely different graphs and looking back at some data from the past. That said it’s been interesting and may have something for the future. 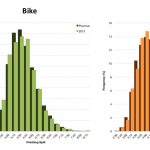 Basically the question was had I looked at run and bike ATL/CTL/TSB separately (I’ve covered the details of the Performance Management Chart before, go here for the details if you’re not sure). In my previous post analysing Ironman UK the chart I presented was the combined ATL/CTL/TSB values. You can see it again just below if you don’t want to read the post. My observations at the time were I’d been very close to Joe Friel’s recommended 10% reduction in CTL with my one week taper to Roth. Then for Ironman UK, I’d had a massive drop in CTL probably something like 30% to 40%. Far more than Friel would recommend it represents a significant drop in fitness. The other value to consider, TSB or form, was pretty high at nearly 50 for Ironman UK. Typically recommendations I’ve seen suggest a positive value around the 10 to 20 mark is appropriate. Most people find that when it’s too high then they race poorly as well. I didn’t plan such a massive drop between the two races, it was more a matter of necessity! My legs were tired after Roth and I struggled to train well. Severe soreness in my calves prevented me from doing any real run training. Fortunately things started to come together after a couple of weeks. I recall a relatively short ride with a friend after those two weeks where it was obvious I was starting to get my bike legs back. With running somewhere in the week before Ironman UK I could finally run without any pain! The Performance Management Chart and the values it tracks were designed for cyclists utilising a power meter for accurate performance tracking. The ability to assign a pace based run TSS is a more recent addition. As such how well the combined values work is open to question. More generally you do have to learn what works for you with races. Whilst the 10% drop off of CTL or the TSB sitting in the 10 to 20 range is a guideline it’s not a rule. As requested I broke out the values and initially posted a graph in a comment on the original post. I rushed and didn’t present all the values though! So this evening I’ve spent a little more time to make things more presentable! Below is the Performance Management Chart for the bike. Starting from just after Ironman Lanzarote you can see after about a week I started some training again. I’ll admit that I rushed back into things from frustration with the events in Lanza. Not feeling so trashed from the long, but lower intensity race I was able to return to training quickly. It wasn’t until the third week after Lanza that I properly started training though. 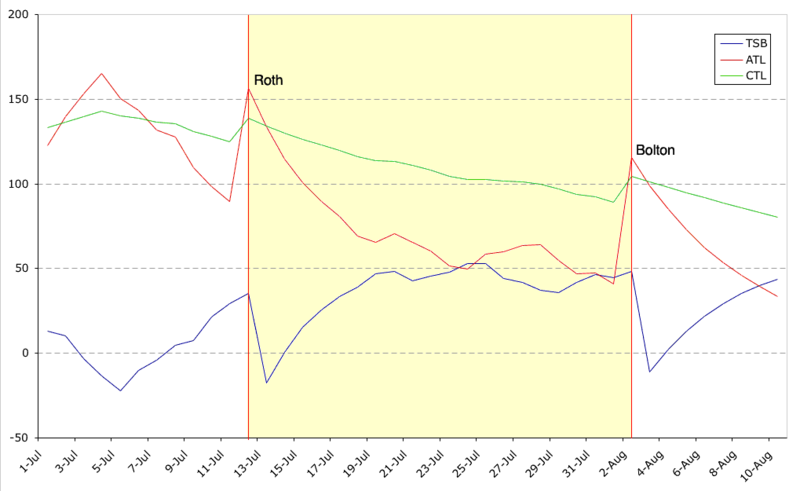 Skipping past my build I had a single weeks taper for Roth (first red line). Starting around the 6th of July my CTL (fitness) is around 100 and drops to about 90 prior to race day – exactly on the 10%. Also note the TSB (form) value is around the 15 mark prior to the race. Both are right on the mark for recommendations. That said my recollection of the Roth bike is my legs felt tired to start and took the first lap just to warm up. Certainly I rode much more strongly in the second lap and the power data supports this. Was my ATL (fatigue) too high, or possibly I need a slightly higher TSB for a good bike? 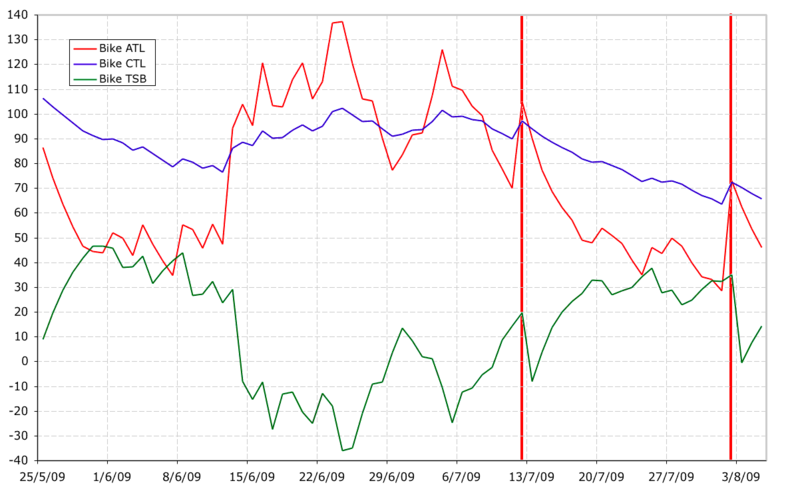 As you can see from Roth onwards There’s a steady decline in CTL and TSB levels out around the 30 to 40 region. 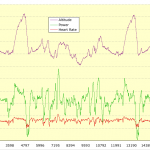 By Ironman UK race day (second red line) my CTL has dropped by around a third and my TSB is at about 32. Both way outside the guidelines. I’m not entirely sure those guidelines apply to that particular race combination though! Perhaps they should, but as mentioned I couldn’t train well enough to hit those numbers. Ideally prior to the race I would have wanted a bike CTL around 85 and my TSB around 20 I think. My performance on the bike at Ironman UK was pretty good, though I didn’t feel it was spectacular. Slow to start again, but strong in the final lap. I wonder if I had been able to train more in the gap I might have been capable of a better performance? As it was it worked well in the end, but it’s an interesting question. We’ll go straight to the races this time. 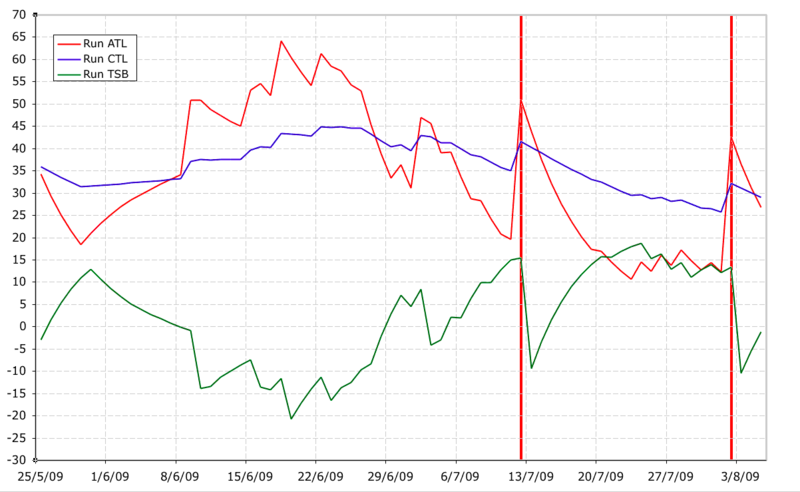 My one week taper for Roth again yielded a 10% reduction in CTL and a TSB around 15 prior to race day. Spot on the guidelines and the result was my first Ironman marathon close to the 3:10 mark. Clearly a good performance so those guidelines seem to have worked well. My impressions of the run was I was a little tired and for some of the middle section I had to push to keep close to my goal pace. However come the last 10km I had plenty in the tank and was able to finish very strongly. Pacing was good and had presumably been so throughout the race. As mentioned post-race I discovered I just couldn’t run – it was too painful! I made my first real attempt about ten days later and was slowly able to introduce very short runs. You can see from the low ATL values in that period I never did any significantly stressful run. The result was my CTL dropped by almost 40% from Roth to Ironman UK. We’re way off those guidelines here. Consider the TSB though and as with Roth it’s not far off 15. My run was again close to 3:10 so a great performance! It was hard work and I had to dig a bit in that middle section to maintain a solid pace. I was definitely less fatigued (ATL was lower too). Once again I managed to finish strongly and push the last 10km home. Picking through this data got me thinking. Whilst I’ve looked at the Performance Management Chart regularly and tried to use it as a guide I’d never been entirely happy with the results. I suspect the issue is trying to consider combined values for running and biking. Fine as a rough guide to current training, but I now think it hides some details. It’s time I tracked the two separately particularly around races. From what I’ve seen for the bike I think that 10% drop is relatively important, but more significant is where the TSB lies. My gut feeling is that it was a little too low for Roth and a bit too high for UK. Somewhere between the two lies the perfect value! My aim for Kona then is to taper so as to produce a Bike TSB around the 20-25 mark. Probably as close to 20 as I can. I’ll also look to do this whilst significantly reducing fatigue (ATL), but going for the 10% drop in CTL. For the run I’m aiming for that TSB of 15 yet again, it’s worked well so far so let’s keep it as a starting point. Otherwise I’m sticking with the 10% drop in CTL as it seemed to work well enough for Roth and I don’t feel there was nay major benefit to the big drop leading to Ironman UK. This will be interesting to track in the lead up to Kona. My plan is to continue my build week as planned and then track these values carefully during the taper, using it as a guideline to how I train in those two weeks. I’ll override the plan to keep the values heading in the direction I want. Easier now I have goals. How this will translate to actual race day performance is an open question of course! OK, I know there’s nothing here about swimming. The problem is what I’ve read about estimating a swim TSS is plain awkward. It’s awkward enough that I’ve never been willing to put the work in! Obviously if I did my viewpoint would now be I would need to consider the values separately in terms of a taper. 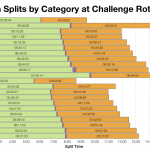 Identifying ideal TSB, CTL and ATL from a series of races to set the goal parameters. Coincidentally on my easy runs the past day or two I had been considering whether to attempt estimating swim TSS after Kona. It seems to be a missing component. Most notably in my week four Kona Build data whilst my hours are about normal my overall TSS is low. The reason is a lot more has been contributed by a heavy swim load with lighter bike and run. It’s a short coming of the combined chart at the moment as it doesn’t truly represent my training load. That turned out much longer than planned. Thanks to Maryka for the question, it’s provided some very interesting food for thought. Go read her blog, it’s very interesting. I’m impressed by her highly analytical approach to training and the results she gets on it. Week three analysis should finally arrive tomorrow, better late than never!